This program performs the whole design process for the package designer. It can deal with air cooled and evaporative cooled condenser DX packages and chilled water air handlers from about 10 kW up to 500 kW. The original program was developed during the time that I was involved in contracting where I had to design packages for a specific application, but it has grown extensively over the last few years as I have developed more powerful programming tools. The idea was to be able to write down a list of airflows and let the program automatically design the whole range. This might sound optimistic but it has been so successful that after the program has done an auto-design there is very little manual tweaking that is needed. Generally, you would start with a specified range of airflows. 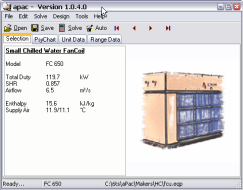 The program then assumes a capacity from a design factor. Using this capacity, the major equipment can be selected starting with the compressor. Coils and valves are selected to be able to cope with the actual compressor duty. Finally, as the designer, you now browse through the computer selections and fine tune the result to get a practical design. As you do this, you will automatically be able to see the effects of any manual changes that you make on the system performance.